One of the updates we’ve made to the Government Service Design Manual is to add video case studies. Video has been one of the best methods we’ve found for quickly and candidly sharing what it’s like to work on a digital service. We’ve been experimenting with video for some time now, from the regular week notes to these talks captured at SPRINT13. Initially, it proved to be a great way of sharing what’s going on within a growing team - especially as development on GOV.UK ramped up and GDS expanded. 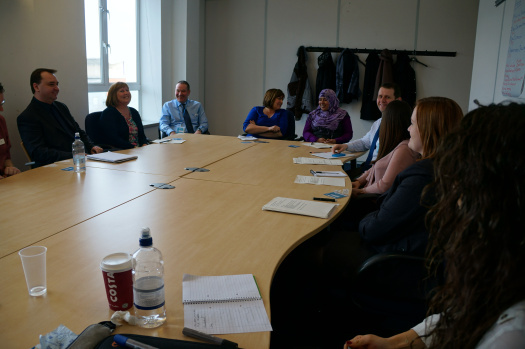 But we soon got feedback from colleagues throughout the civil service that they liked seeing how other teams talk about their work. In the case of the manual, videos are a great way of giving a personal perspective to the huge amount of information and guidance we’ve published. People learn in different ways, and having someone talk about their experience of working on digital services can be a really valuable way of sharing information. Recently, we visited some staff at a DWP centre in Sheffield to find out more about their experiences with video. They told us that short pieces, in which people doing the work spoke directly about it, were the best way of finding out about new initiatives or techniques for working. No need for snazzy animation or scripting; just simple, candid conversation. There are technical benefits to making videos like that: it means we don’t have to spend too long on post-production, and also means we don’t need to spend lots of money on high-end equipment or locations. But, most importantly, it means the focus is entirely on the interviewee. Lots of people, when asked to talk about what they do, do a brilliant job of explaining it quickly and clearly. The interviewer just needs to find the right question to ‘unlock’ their insight and enthusiasm. As well as publishing these videos in the manual, they’re also on our YouTube channel. We want to make sure that videos can be shared far and wide by anyone who finds them useful, whether those people are in government or not. We also know that while video is a great tool for a lot of people, there are still plenty of people who can’t access them. So we’re making sure that each video is accompanied by either a transcript or a passage of text covering the same ground. We’re still exploring new ways of doing that, and new options for embedding transcripts that cater better to those with accessibility needs. We’ll be adding more videos to the manual as users begin to request them, so if there are any topics you think could benefit from some first-hand insight, let us know. Transcripts are great but it would be better if the videos also had captions (for the deaf and for those of us that don't have a soundcard, or those of us that work in a shared office and don't have headphones!) . If you get to the videos via YouTube they don't seem have a link to the transcipt and neither does the video above. You're right Shawn. Oversight on my part there, will start adding those ASAP. If video case studies are useful "the case of the manual, videos are a great way of giving a personal perspective to the huge amount of information and guidance we’ve published. People learn in different ways, and having someone talk about their experience of working on digital services can be a really valuable way of sharing information" should we also not provide this service to customers of gov.uk information? E.g. video case studies to comunicate about our online transactions or other information that users can find on gov.uk etc? That's a very good idea. I'd certainly like to explore that. It's something GDS investigated during the GOV.UK beta (Graham wrote about it last year http://digital.cabinetoffice.gov.uk/2012/02/13/creating-videos-for-gov-uk/) but at that point in time the style we currently use hadn't quite taken shape. Something I'll talk to a few people about anyway. Thanks for the feedback Claire. A fantastic use of video - to explain processes and in-effect, creating better documentation. Stats say that people learn better when they see and hear, than just reading text, so using video in this way is definitely the way forward. Thank you for taking this (brave) step - I hope it serves as an inspiration to other organisations and corporates particularly (who can document quite poorly!). Cheers Ross! I have to admit though that it hasn't felt all that brave for our part - it's just been a terrific way of sharing and documenting information.